Tomorrow my husband and I celebrate twenty-two years of marriage. We thought we knew what we were getting into when we got married. We had no idea, but we agree we wish we had done it a lot sooner. There have been a lot of adjustments made, a lot of maturing done, and a lot of storms weathered. We’ve learned a few things along the way, and one of them proves what relationship books and counselors will tell you– Open, honest communication is key. Communication involves two processes – speaking and hearing. I did a quick search about speech in Scripture and there is plenty of advice on choosing your words carefully, and about the power of words for good and evil. I didn’t find as much on hearing. Oh, hearing appears numerous times, but it’s in the context of hearing instruction in order to obey, or God hearing prayers. How we listen to each other is covered indirectly by verses like these. What do those verses have to do with hearing? In our marriage, here’s how those guidelines Paul gave have played out. Goofy examples aside, research has shown that we rely on nonverbal cues, on body language, on facial expressions, on tone of voice far more than the actual words. Then we mash that together with vulnerabilities and fears that may be rooted all the way back in our childhoods before we hear anything. Hearing each other with grace and humility is one of the biggest lessons we’ve learned in our marriage. What is a big lesson you’ve learned in your relationships? 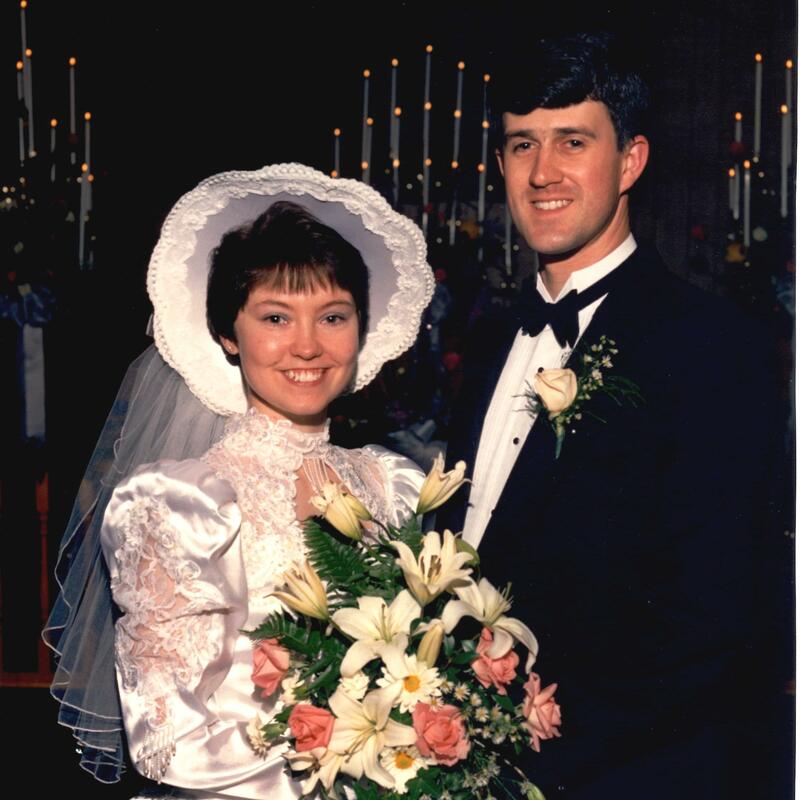 Today, my husband and I celebrate twenty-one years of marriage. It just so happened, earlier this week, while cleaning and reorganizing my office, I came across the box with our engagement pictures. Wow, have we changed. But the changes are much deeper than the character lines, or the acquisition of some eyewear. Our love is stronger, and our trust in each other is much deeper, and I'm certain our commitment to each other is unshakeable. And as icing on the cake, we have three beautiful children to share our lives with. Honestly, I am overwhelmed by the grace and blessings of God. As I sat considering all these blessings, I began to think– I've been in a relationship with Jesus for years. So I asked myself these questions. Has my love for Him grown stronger? Is my trust in Him deeper? Is my commitment more solid now? Do I have "children", others I've helped discover their own relationship with Him? Am I overwhelmed by the blessings of my relationship with Christ? Compared to when I was seven and first met Jesus, of course the answers are all yes. But compared to five years ago or last year or last summer, I'm not so certain. Just like my marriage, I can look back and identify seasons of tremendous growth, but I can also point to periods of stagnation, too. Maybe you can identify similar trends in your relationship with Christ. But here's the thing. That's all on my end. His love for me is eternal. It has never wavered or waned. He declares it in Jeremiah 31:3 "I have loved you with an everlasting love; therefore I have continued my faithfulness to you." Take a moment and let that sink in. Everlasting. Faithfulness. To us. Wow. P.S. Jon has done more to help me grow in my relationship with Christ than anyone else. Just another reason I am so glad to be celebrating with him.